The following is a list of veterinarian hospitals in the San Diego and southwest Riverside counties that we know to treat rabbits on a regular basis. We have listed names of vets with whom we are familiar, however there may be additional vets at that location who do see rabbits. Please ensure that when you make an appointment, you ask to see a vet with extensive rabbit experience. This list is provided only for your convenience and in no way should be considered an endorsement by San Diego HRS of any vet or clinic listed. San Diego HRS cannot guarantee your satisfaction with any vet. San Diego HRS cannot guarantee your satisfaction with any vet. Please call and talk to the vet and/or their staff before making your initial appointment. If you need advice on what questions to ask please review the article, "How to Find a Good Rabbit Vet." 655 W. Citracado Parkway (just off I-15), Escondido, CA 92025 Note: This hospital also offers holistic services, including acupuncture, veterinary orthopedic manipulation (VOM), laser therapy, and herbal medicines. Open 6 days a week with urgent care hours, Monday through Friday till 9 p.m.
* This clinic now offers acupuncture! *Note: General medicine and spay/neuter services, Monday through Friday. 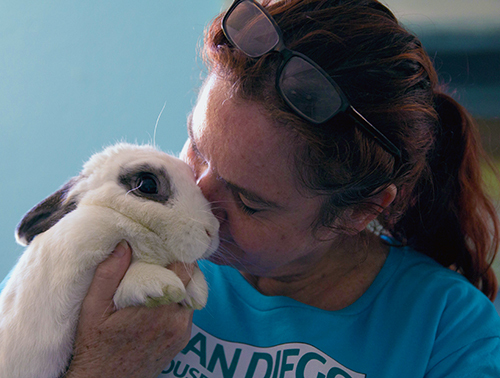 The clinic also sees rabbits on an emergency basis, 24 hours per day, 7 days a week. 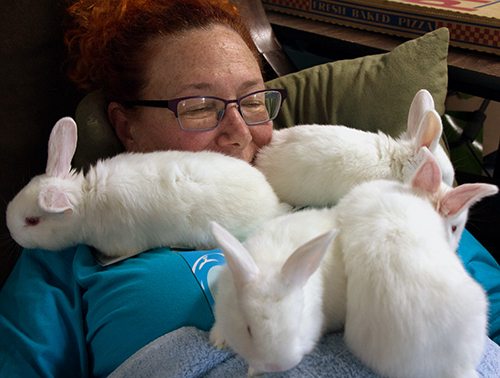 *Dr Cecil provides a 15% discount to SDHRS members at his daytime rabbit clinic only. Must present a valid SDHRS membership card (get at SDHRS Bunny Store). Note: This location offers acupuncture and chiropractic. NEED ASSISTANCE WITH MEDICAL CARE COSTS? 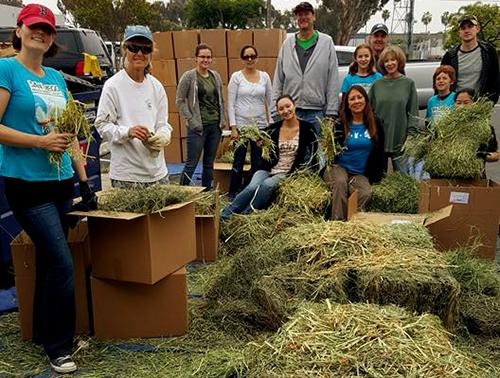 The list below includes clinics that we know to regularly spay or neuter rabbits and offer lower-cost options to the public as a community service. Grand Animal Hospital, Pacific Beach (858) 272-1320 *Tell them "HRS sent me." Checks are mailed out twice a month. You may submit a maximum of four (4) receipts at one time. **Note: Donations are gratefully accepted to support this program. 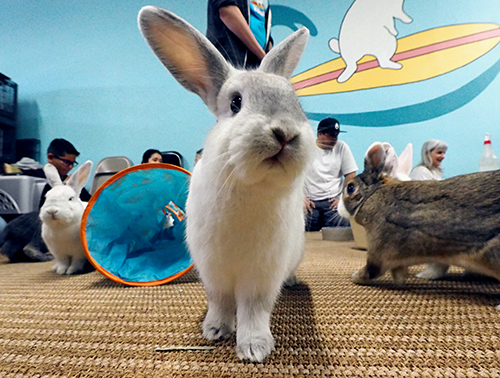 If you'd like to support the spay/neuter of domestic rabbits living in San Diego and southwest Riverside counties, make a donation to our Spay/Neuter Fund. Click on "Donations" to learn how. The time to find a veterinarian is now, not when your rabbit is sick and you are forced to take what you can get. A good place to start in finding your rabbit's veterinarian is to ask for recommendations from pet shop personnel, other rabbit owners and rabbit special interest groups (such as the House Rabbit Society). Then move on to interviewing the veterinarians. The secret here is not to ask "Do you see rabbits?" but, rather, "Who in town should I take may rabbit to?" 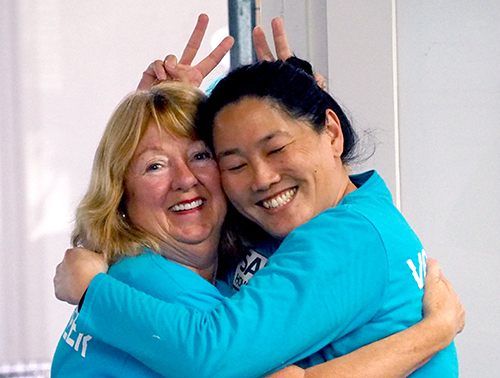 If the vet volunteers "We see rabbits," jot down his or her name. Take the time to call around in a radius from your home that you feel would be close enough to take your rabbit in case of a problem. Select two or three and call for an appointment to meet them. Most hospitals charge for an office visit, but some waive the fee for a quick non-medical consultation. Don't be afraid to ask questions. You need to have a way to discern his or her level of knowledge and experience with rabbits and, just as important, your ability to communicate with each other. A good rabbit veterinarian will have a working knowledge of rabbit anatomy and physiology, nutrition and the common diseases and syndromes of rabbits. 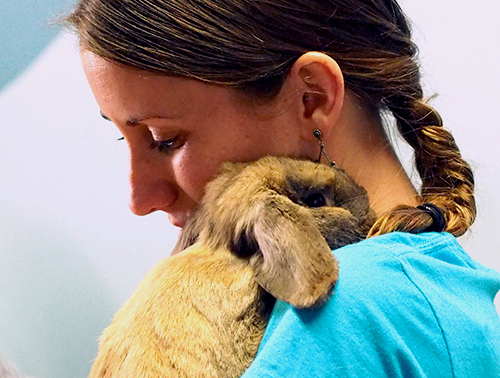 Rabbits should make up a sizable part of the vet's practice. 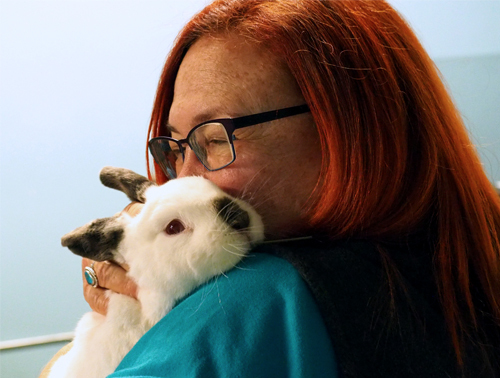 Unless you find a specialty practice, it is unlikely that rabbits will make up a significant portion of the patients, but 10 percent would be an acceptable minimum. Ask what special equipment and services the hospital offers for rabbits. The "standard of care" should include the use of sevoflurane anesthesia, the ability to trim incisor teeth using a dental drill (not toe-nail trimmers) and, preferably, the ability to house the rabbits away from barking dogs and the odors of cats. When seeking details, ask open-ended questions. For example, don't ask, "Do you use sevoflurane?" Instead ask, "What type of general anesthesia do you use for rabbits?" "How would you fix overgrown incisor teeth?" "What housing arrangements do you have for rabbit patients in your hospital, particularly in relation to other animals?" A critical questions is "What oral antibiotics do you commonly prescribe for rabbits?" If the answer ends in "-cillin" (amoxycillin, ampicillin, etc. ), beware. Oral (but not injected) "-cillins" are deadly to rabbits and you need a vet who knows that. Finally, ask about prices, but don't let this be a deciding factor. Finding a knowledgeable veterinarian with whom you feel confident and who can communicate well with you can be worth paying the extra price. After finding a vet, your next goal is to maintain a relationship with this doctor. Although rabbits don't require regular vaccinations, they should have an annual physical exam. This exam can help detect problems early and help you plan health management as your furry companion ages. Unless you've adopted through the House Rabbit Society, which provides companion animals who are already spayed or neutered, you will need a vet to perform these non-emergency surgeries. Male rabbits should be neutered (also called orchectomy or castration) to alleviate urine marking and sexual mounting (mounting may recur intermittently as a behavior to demonstrate dominance). Female rabbits have a high incidence of uterine cancer, hence they should be spayed (also called ovariohysterectomy or OVH). This procedure is safer and easier on the rabbit if performed while she is young. 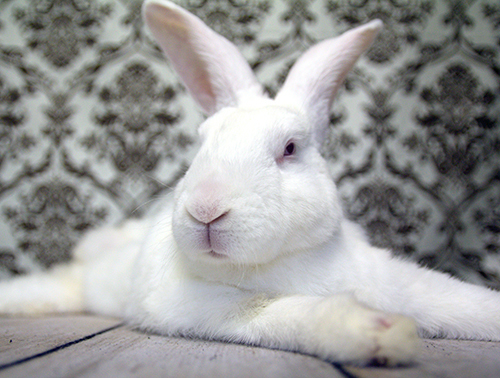 We recommend surgery between the ages of four months (when most rabbits become sexually mature) and one year. Rabbits may be spayed at an earlier age; however, no studies have been done to show the effects of spaying prior to sexual maturity. Whomever you choose as your veterinarian, for the sake of your companion rabbit, be sure that vet has a good knowledge of rabbits.Visit our local, recommended veterinarian list.